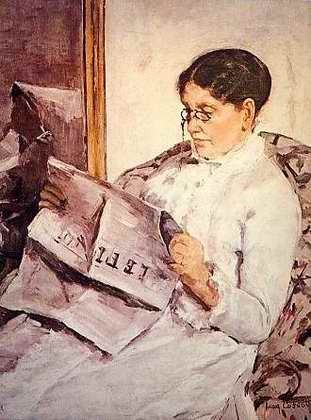 Mary Cassatt (1844 - 1926) was the daughter of an affluent Pittsburgh businessman, of French ancestry. In 1861, she studied at the Pennsylvania Academy of the Fine Arts and was required to draw copies of prints and plaster casts before she was allowed to paint. Between 1865 and 1869 she travelled and studied throughout Europe. In 1868, Cassatt had her first painting accepted by the Paris Salon.